Growing up, I had two favorite types of fish. Shrimp, and tuna in a can, and that was pretty much it. I’m going to be honest and say I haven’t eaten fish or meat in quite a while, and when I do it’s very sporadic. Just not digging it as much as I used to. 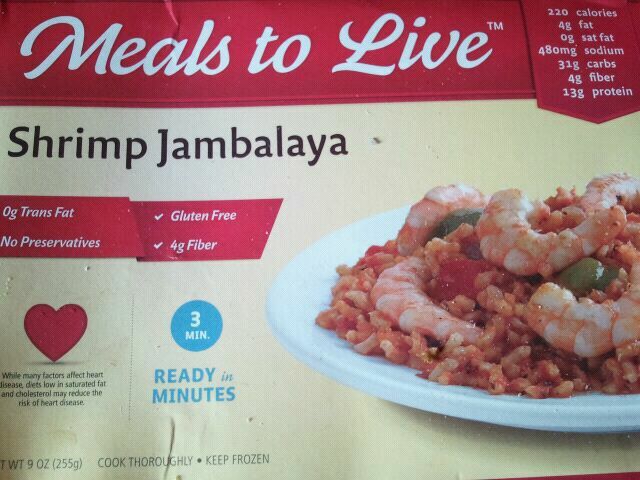 However, hunger rolled around 5 pm today, and looking through my freezer, the Meals to Live Shrimp Jambalaya meal popped out. Mmm. This sounds good- I haven’t had shrimp in forever! I thought. So after steaming up some veggies (since I had a feeling the meal would be small), I cooked this gluten free entree. How yummy does this look??! A little dark, I agree. I couldn’t get a pic with good lighting since people were eating at my kitchen table and I didn’t want to be rude. I transferred to a plate and then added veggies on the side. There was actually more food than I had expected, which was a positive for me. Also, I noticed there was some extra juice/liquid that I just discarded. It smelled pretty spicy, so at first I was a bit worried. I tried a piece of shrimp first, expecting a juicy, plump shrimp. However, that is not what I got. It was very tough and chewy, and had a fishy taste to it. I know, I know, “it’s seafood!”, but I have had shrimp before that tasted very good, and not fishy. I moved onto the rice, which wasn’t bad. It was fluffy in texture, but just very bland. It had no salty flavor to it whatsoever, and more tasted like bland rice with some spices. There was a bit of heat, but not as spicy as I thought it would be. There was also some peppers in the meal, that didn’t really add or take away from the meal. 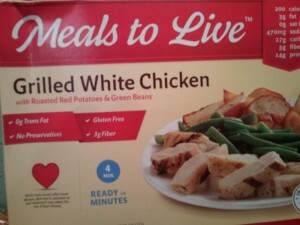 Overall, I was not a fan of this meal. 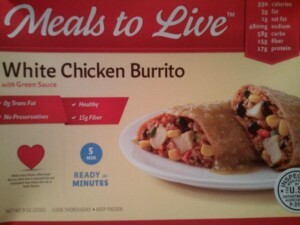 I liked this meal from Meals to Live much better, and would prefer it over this one. 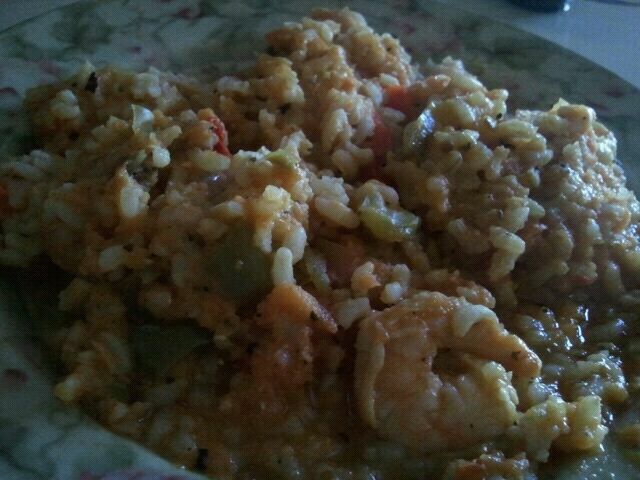 The Shrimp Jambalaya gets 2 stars from me, because I happened to enjoy the rice even though it was rather bland. What’s your favorite seafood to eat? Or if you are a vegetarian/vegan, did you used to have a favorite? I was provided this meal to try for free from the company. One of the things I love is roasted red potatoes. I’d take them over mashed/baked potatoes anyday. Something about the crisp outside and soft inside and great flavor that always wins me over. 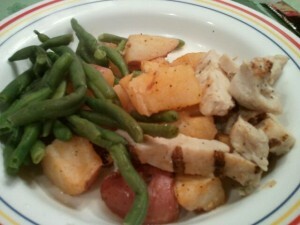 So I was excited to get the Meals to Live Grilled White Chicken with Roasted Red Potatoes & Green Beans in the mail the other day and try it. 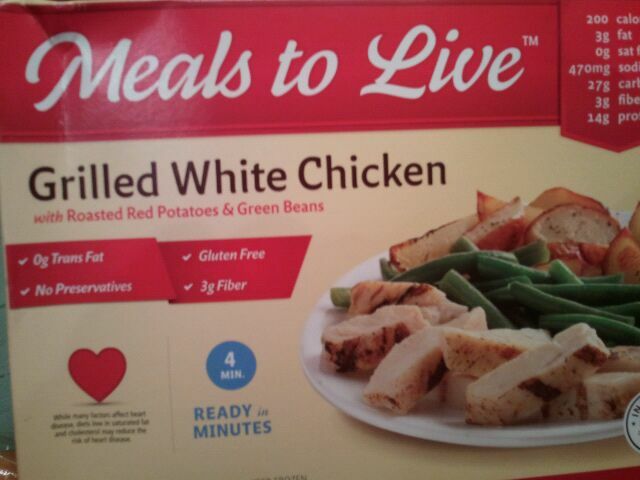 I recently tried the other two Meals to Live frozen meals, and was hoping this one would be my favorite. When I did transfer it to a plate I noticed a rather good amount of liquid went with it. Chicken Broth? Water left over from the frozen green beans? I wasn’t sure, but I just discarded it. First I tried the green beans. They were a bit disappointing- a little chewy, with a hint of salt flavor to them. Not bad, but not spectacular. Next up, the chicken. Much better than I had expected! It was a bit salty, chewy, and actually quite delicious! A few pieces were a bit dry, but nothing too serious. And now, the potatoes! I couldn’t wait to try these. The box depicted them as being crispy, so I was let down to find out my potatoes were mushy. I kind of expected it, seeing as I cooked it in a microwave instead of the oven, but they tasted more like a baked potato than roasted potatoes. However, they were still pretty good. They had a good flavor, and although the texture didn’t live up, the taste certainly reminded me of yummy roasted red potatoes, with a bit of black pepper flavor as well. Overall, a pretty good dish. More food was put on my plate than I had expected, because I thought the tray was rather small. I wish there was a different vegetable instead of green beans (perhaps broccoli?? =) ! ), because the texture kind of brought the dish down. However, I would certainly eat it again. 4 stars. This dish is also gluten free, according to the box. 1 package (198 grams) is 200 calories, 3 grams of fat, 27 grams of carbohydrates, 3 grams of fiber, 1 gram of sugar and 14 grams of protein. What’s your favorite way to eat POTATOES? I was provided this meal to try for free from Meals to Live. I opened the box, cooked it for about 5 minutes in the microwave, and took off the plastic. I saw a rather large brownish square with some green color on it as well from the green sauce. I then transferred it to a plate, and noticed that the “green sauce” as stated on the front of the box was more like a green paste or gel. It certainly didn’t have a lot of fluidity, and was just kind of like a spicy green jelly. As you can see, it took up the majority of my plate, and was rather large. 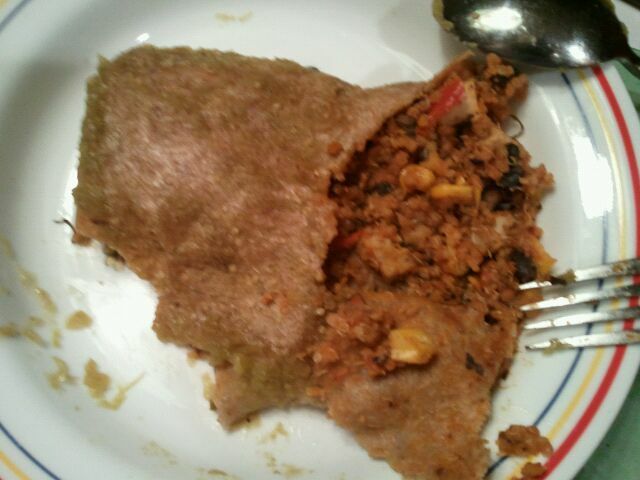 The inside had quinoa, black beans, corn and more. I decided to try the tortilla first.It was actually pretty good- chewy, slightly crispy on the edges, and quite yummy. The green sauce didn’t really add much to it, aside from a little bit of spiciness. Next, I tried the inside of the burrito. It was rather dry, and kind of pasty. There were also pieces of chicken on the inside which were chewy, but good, and not overly salty tasting. There wasn’t a lot of unique flavor going on because it was SO SPICY! Honestly, I couldn’t really distinguish flavors of anything because it was so overly spicy. Perhaps if you like the heat in foods, you would like this, but so not for me. All I could taste was the spice! Overall, it wasn’t exactly my favorite dish, but perhaps I would have liked it more if it wasn’t so SPICY! And, it did have pretty impressive nutritional stats, leaving this dish at 2 1/2 stars. 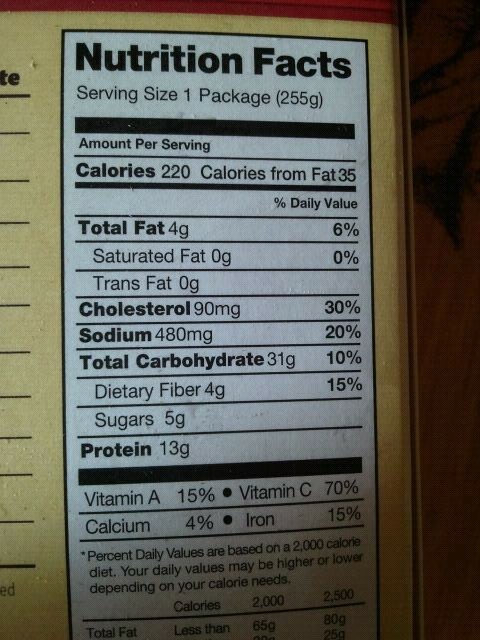 1 package (255 grams) is 5 grams of fat, 58 grams of carbohydrates, 15 grams of fiber, 8 grams of sugar, and 17 grams of protein. If you could make the perfect burrito, what foods would you put in it? 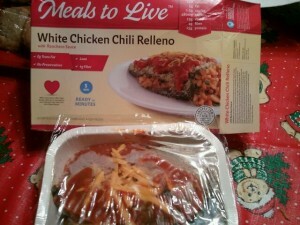 Recently, I was asked to do a review of some frozen dinners by Meals to Live. While I love frozen meals for convenience (Amy’s Kitchen has my heart! ), I also watch out for preservatives, excess sodium and additives when choosing them. One of the reasons I agreed to eat Meals to Live as that the ingredient list seemed pretty good, and according to the box, they were “a fundraising partner of Diabetes Friendly Foundation”. Last night for dinner I chose the White Chicken Chili Relleno with Ranchero Sauce. It seemed like a large piece, but I also steamed some broccoli to have on the side. There was 15 grams of protein in one package (255 grams), with 480 mg of sodium and 5 grams of fat, so it seemed pretty good to me. Frozen, it kind of reminded me of fried eggplant for some reason when I looked at it. So I cooked it for about 5 minutes in the microwave (and it sure smelled quite saucy/spicy as it was cooking!) and then sat down to eat. First of all, I was like, what IS this? From what I could tell, it was a chili poblano that was breaded and covered with sauce and cheese with pieces of chicken, sauce and rice inside. The sauce was slightly sweet at first, and then it had a spicy/salty and oniony flavor. The chili poblano itself resembled a giant spinach leaf, which is what I thought it was at first until I read the ingredients again, and was spicy at some times, but then bland and a bit watery at others. It reminded me of a giant chewy noodle, in a way. The chicken and rice with the sauce was the best part. Flavorful, chewy and a bit salty, but pretty good. There wasn’t a lot of rice or chicken, but the amount given was quite tasty. Overall, the meal reminded me of a stuffed pepper I ate when I was growing up. It was pretty good, and I am quite satisfied after eating it with some broccoli (ok, and a leftover Christmas chocolate chip cookie…). I wasn’t crazy about the outside chili part, but the insides were good. I do wish it came with a side, like rice or a vegetable, rather than just that alone. Overall, 3 stars. 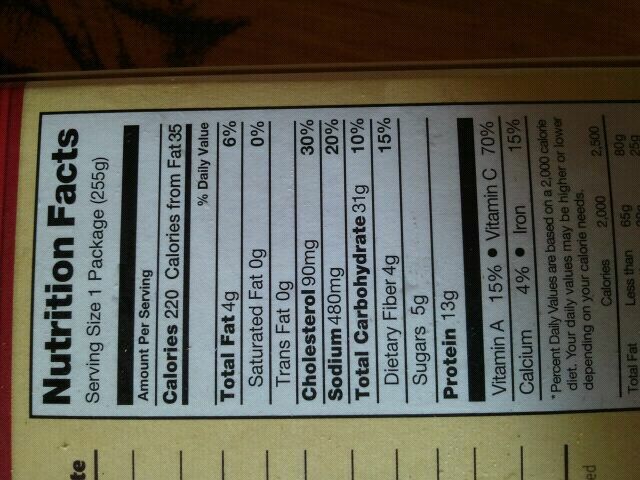 1 package is 210 calories, 5 grams of fat, 29 grams of carbohydrates, 4 grams of fiber and 15 grams of protein.